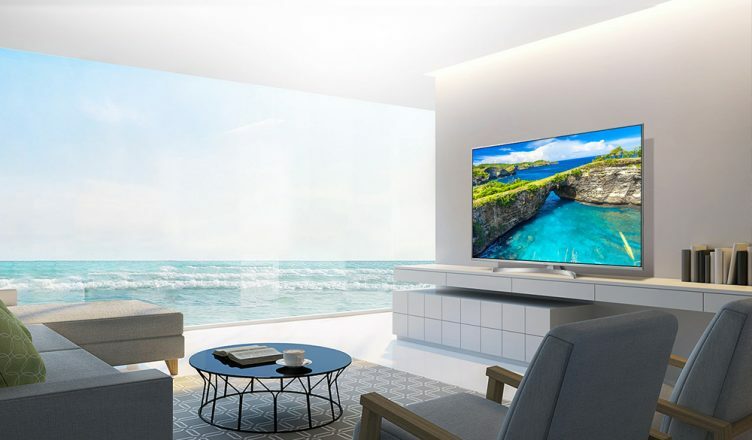 The LG ULTRA HD 4K TV is a part of LG’s UK75 series mid 4K range TVs, which comes in various sizes from the 49” model, through the impressive 55” model and rising to the frankly amazing 65” model. This range has a 4 core processor in the TV and if you were like me and unsure of what that exactly means then the processor will give the TV picture a brighter and sharper 4K image. All of LG TVs come with their stylish modern design with a metal frame that wraps around the TV. It also has a very complementary sweeping stand, giving your TV set and room a very elegant touch. The LG TV includes DTS Virtual X which gives you an immersive sound to your room. What DTS Virtual X does is, put simply, gives sounds different dimensions. It does this by placing sounds where they would naturally occur in space, thus giving you a natural and improved heightened realism to your TV audio. This LG TV also offers you its precise nano-cell colour performance; these cells apply nanoparticles that will optimise each and every colour. This kind of technology delivers a full spectrum of colour to your TV, thus giving you not only a more enjoyable watch but also will give you lifelike pictures from the comfort of your own home. Not only does it offer you the nano-cell but it also offers you an LG technology called Ultra Luminance. This state-of-the-art technology produces brighter shades of white and darker shades of black through local dimming technology. What this means is that it will brighten up your TV picture to a whole new level and will also give you the perfect dark shades to bring your movies to life and will also make every day TV a viewing pleasure. The Ultimate HDR 4K picture technology. 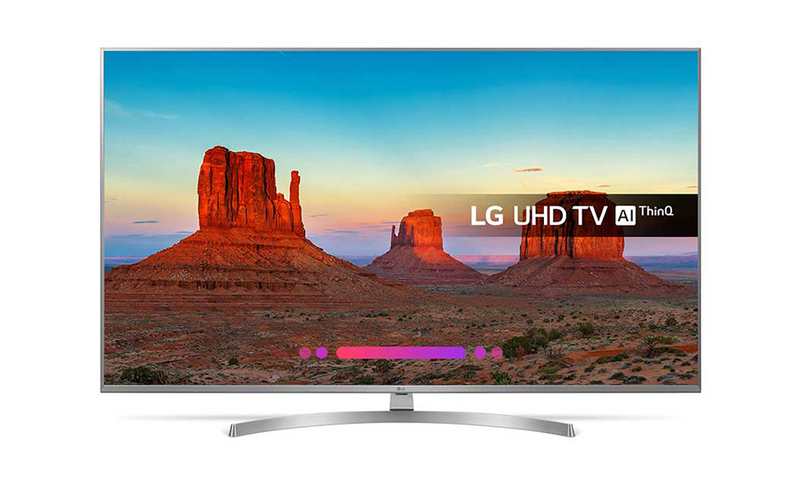 The LG 49UK7550 comes with its own active HDR. 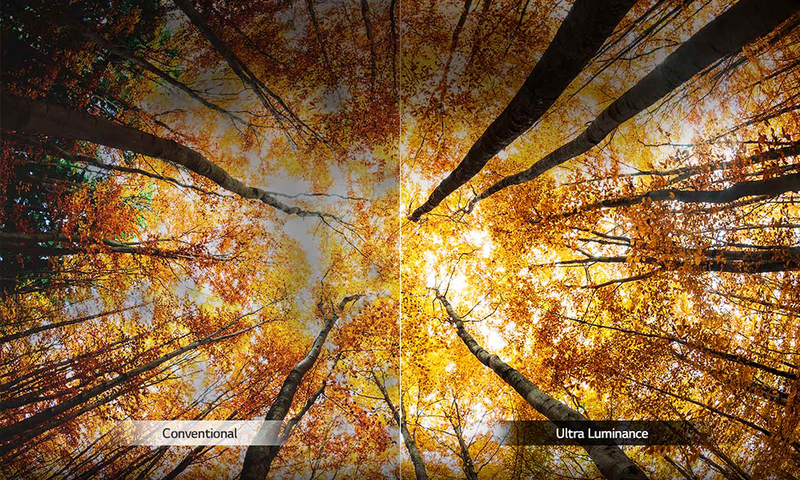 This means that it is a more improved standard HDR. The active HDR technology will adapt to all your HDR formats giving you the best real life image at home using combination of lights, darks and colour accuracy, meaning it will provide you with scene by scene image mastering and pinpointing a better picture production. Basically, active HDR is far better than standard HDR. The UK75 range is the starting range for their new LG ThinQ operating system which all include their Magic Remote. 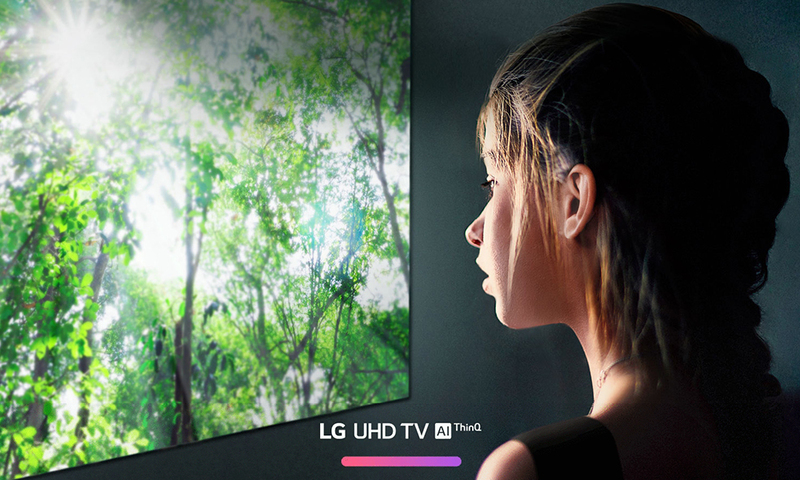 The LG AI (artificial intelligence) delivers instant TV at your (voice) command. You won’t have to worry about clicking orendless scrolling through to change settings, find your favourite programmes or TV shows. Thanks to LG’s AI, all you will have to do is simply say what you want and it will handle your command for you. Even when it comes to searching for video clips or shows, again just say what you are after and LG AI will discover it and find it for you whether it’s on Freeview, YouTube orNetflix. If gaming is more of your thing you can even ask AI to launch your game console and it will do this by switching the TV input – and you don’t need to lift a finger! With the Magic Remote you can also ask the TV to set timers, giving you more control over your TV and it being personal to your needs, such as asking AI to turn off your TV once the programme you are watching ends. You can buy from the LG 7550PLA range online and even rent, from £10.38 per week. If you’re interested in more information about this product, then give your local Hughes store a call or pop in and ask one of our knowledgeable sales staff to demonstrate all that this TV can do. Subscription and internet are required for some services.